A pod of 12 dolphins working together created a living “raft” to help keep a dying dolphin afloat in the East Sea, South Korea, according to a paper published in Marine Mammal Science. This is the first documented instance of dolphins working together as a team to try and save one of their own. 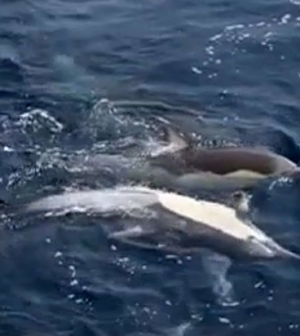 The dramatic rescue attempt conducted by the wild long-beaked common dolphins was captured on video. Sadly, the dolphin at the center of the efforts died. But the moment suggests how compassionate and caring dolphins can be. Kyum Park of the Cetacean Research Institute in Korea led the study. He and his colleagues wrote that, before this discovery, two primary forms of dolphin care-giving were known to exist. “The most frequent type involves care by a mother dolphin for her calf in difficulty, whereas the second type involves the support of an adult dolphin to maintain a dead dolphin afloat,” the researchers noted. The latest footage appears to fall into that latter category, but with the added element of teamwork. The group also appeared to try and resuscitate the sick dolphin, by biting and otherwise trying to stimulate it. Park and his team observed the living dolphin rescue raft during a routine study of marine mammals off the coast of South Korea. The researchers have been studying dolphins regularly there since 2004.